Joel Politi’s Serengeti Empress confirmed that her 13 ½-length Ellis Park Debutante win was no fluke when she rolled to a front-running 19 ½-length demolition job in Saturday’s 50th running of the $200,000 Pocahontas (Grade II) for 2-year-old fillies at Churchill Downs. Ridden by Corey Lanerie and trained by Tom Amoss, Serengeti Empress broke alertly from the rail and ran 1 1/16 miles on a fast track in 1:45.47 to easily dismiss her 10 rivals. She set solid early quarter-mile fractions of :23.17, :46.94 and 1:12.20 along the way. Southern California invader Splashy Kisses was a distant second with Lightscameraaction another 1 ½ lengths back in third and My Wynter Rose another head back in fourth. Serengeti Empress, a Kentucky-bred daughter of Alternation out of the Bernardini mare Havisham, banked $116,560 for the win and guaranteed herself a starting spot in the $2 million Breeders’ Cup Juvenile Fillies (GI) on Nov. 2 at Churchill Downs. 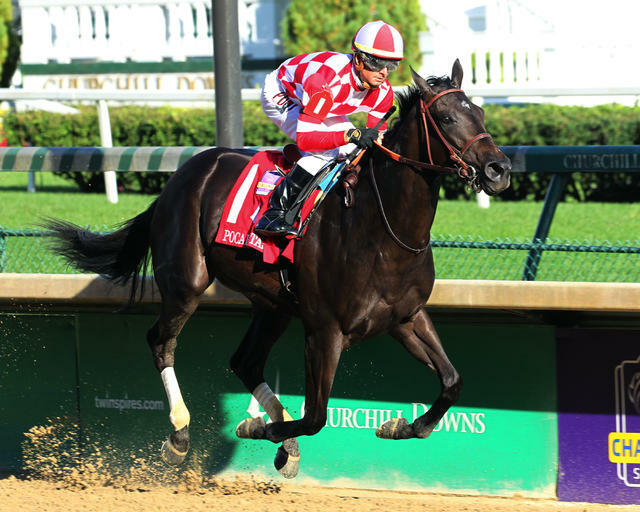 The Pocahontas is part of the Breeders’ Cup “Win and You’re In” Juvenile Fillies Challenge Division, which means the winner will also will have her entry fees and a travel allowance paid by Breeders’ Cup. Serengeti Empress (4-3-0-0—$187,870) paid $3.80, $2.60 and $2.40 as the 4-5 favorite. Splashy Kisses, ridden by Del Mar’s leading rider Drayden Van Dyke, paid $4.20 and $3.60. Lightscameraaction, with Robby Albarado up, paid $6.80 to show. After Wynter Rose in fourth, the order of finish was completed by Love My Honey, Include Edition, Profound Legacy, Taylor’s Spirit, Two Dozen Roses, Tapping Pearl and Saved At Dawn. It Justhitthe Wire was scratched. For Lanerie, it was his third Pocahontas win in the last four years. He also won the race with Dothraki Queen (2015) and Daddys Lil Darling (2016), both trained by Kenny McPeek.